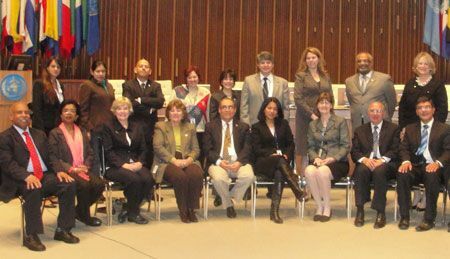 The session which was convened over three (3) days, 16th to 18th March, 2011, allowed the members of the Sub-Committee to deliberate on various issues relating to the operation and programming of PAHO/WHO. The Sub-Committee will then advise the 148th Session of the Executive Committee on the range of issues at their meeting scheduled for June 2011. Administratively, PAHO has implemented the international Public Sector Accounting Standards (IPSAS) which calls for even more stringent accounting measures than under the previous system adopted, thereby lending to enhanced transparency, accountability and general financial management and comparatives in keeping with harmonized practices by the United Nations and its specialized agencies. Amendments were also made to its staff rules and regulations to allow for greater efficiency and effectiveness. A review was also conducted on the Master Capital Investment Plan of the organization as well as the status of projects funded from the holding account. Non-Governmental organizationâs (NGOâs) in official relation with PAHO also formed the basis for discussion and decision making. Much discussion centered around the World Health Organizationâs (WHO) medium – term Strategic Plan 2008-2013. This discussion extended to the draft proposed Programme Budget 2012-2013 of PAHO. Both reflected assistance to the region over recent years and ongoing assistance based on submissions by the various countries addressing their particular circumstances. These range from Health and Nutritional challenges, Preventive Mechanisms and Capacity Building. The Sub-Committee also looked at the facts and impact of the Earthquake, Tsunami and Nuclear accident in Japan, World Health Day on 7th April, 2011, Vaccination week 23-30 April, 2011, Wellness Week 16-22 September, 2011 and the bigger conference at the United Nations on Chronic Non-Communicable Diseases also in September, 2011. St. Vincent and the Grenadines (SVG) is a sitting member (on a rotational basis) of the Sub-Committee along with Guatemala, Mexico, USA, Venezuela, Panama and Paraguay with Canada, Argentina, Brazil and Suriname sitting in as observers. Mexico presided over the session. Minister of Health, Wellness and the Environment, Hon. Cecil McKie attended the meeting of the Sub-Committee in Washington D.C.
SVG also sits on the Executive Committee along with Bolivia, Mexico, Suriname, Argentina, Guatemala, Haiti, Colombia and Venezuela.